shu uemura died last december 29 in tokyo, but why was it announced to the public only now? maybe in japan they knew, but his company only issued a statement yesterday. he died of pneumonia. 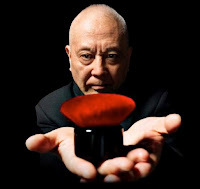 he was 79. xeng zulueta, shu uemura's chief makeup artist in the philippines was lucky enough to have trained under the master. how lucky she was! and she knew it. with her permission, we are re-printing a very personal and touching tribute xeng wrote in her facebook site. I was hired by L'oreal Philippines on August 5, 2002. They needed a creative person to support the brand manager for the launch of a cult brand which was basically unheard of in the Philippines. The type of brand that fashion and beauty insiders knew. The type of brand, even our own Managing Director says would have a tough time being known in the Philippines. I'm going on my 9th year as a makeup artist. 5 of those years have been devoted to SHU UEMURA. Along with Tina Tinio, I helped launched the brand in October 2002 and I recall our boss asking us a few days before the launch how we think this brand was going to succeed. Tina and I looked at each other and both said to him "WE JUST KNOW". As any boss would say, he retorted "GIRLS, IT'S OK TO DREAM, BUT PLEASE GET YOUR HEADS OUT OF THE CLOUDS". Tina and I had no prior cosmetic brand management experience. Tina, coming from a PR background - fluent in Japanese and myself - well a struggling makeup artist with 5 years of high end fashion retail experience. I got a lot of flak when I got hired. Eyebrows were raised, heads rolled, eyes rolled at the idea of me - a novice, a nobody, suddenly given the responsibility of handling Shu Uemura. In true L'oreal fashion, they threw me into the frying pan. I was off to Japan for the first time in my life and not a soul did I know, and not a word of Japanese to save my life. I had seven days to learn 700 products and two months to launch in the Philippines. At the end of the 7 days, I flunked the exam and was reduced to tears with mascara streaks on my face (obviously not shu uemura) and my exasperated training manager says "GET UP, WE'RE TAKING A WALK!". August in Japan is like June in Manila, typhoon season. Here I was in my Prada suit, my manolo Blahniks walking in the rain and looking like a drowned rat - did I mention a self-esteem to match? and seriously getting annoyed with my training manager, Bessie-san. She led me through a maze of buildings in the Aoyama district and then we came upon a pocket garden which looked familiar. She told me to take off my shoes and held the door for me. It was Mr. Shu Uemura's personal Atelier. Like in all the books I read prior to this trip, there he was sitting at his desk with the orange backdrop staring straight at me. I fumbled towards him and fell to my knees. I was sobbing uncontrollably. In Japanese he says "WHAT'S WRONG WITH THIS WOMAN, WHY IS SHE CRYING?" and in my moment of what I now call the epitome of candidness I wailed "THIS IS LIKE MEETING THE POPE!!!!!!!" He told me to get up and asked me why I was crying. I told him I flunked the test. I flunked it miserably. This is what he said to me, which today remains in my heart of hearts - "XENG-SAN, YOU CANNOT POSSIBLY LEARN ALL OF MY 700 PRODUCTS IN 7 DAYS. OF COURSE YOU WILL FLUNK! DON'T TAKE IT TO HEART. LOOK AT IT THIS WAY.....SHU UEMURA IS LIKE A ROSE IN BLOOM. WITH EACH YEAR THAT YOU MATURE WITH IT, A PETAL FALLS AND REVEALS ITSELF TO YOU. ONLY THEN WILL YOU KNOW WHAT THE BRAND IS ABOUT, ONLY THEN WILL YOU KNOW WHAT I AM ABOUT". I stopped crying and held his hand. He squeezed it and then said "OK GET OUT OF HERE, I'VE GOT WORK TO DO". I bowed to say goodbye and headed for the door. And in true Kaicho-san fashion (we call him that, short for chairman) he says...."OH AND ONE MORE THING, THE SUCCESS OF YOUR BRAND NOW DEPENDS ON YOU". The inspiration and motivation he imparted that day remains with me six years later. Of course just like any relationship, the passion dies - it wanes and ebbs, it comes and it goes - but all this - is never about me. It is about him. Being in Manila, the constant challenge is to remain inspired - such a feat because look around you - nothing much to be inspired about, so Tina, Tessa and I along with our team have to find it in ourselves to be inspired. His death on December 29 comes as a shock. We only found out today. I guess he wanted it that way. For us not to be sad on the eve of a new and promising year. In Tina Tinio's words - "HOW FITTING IS IT THAT HE HIMSELF CREATED THIS SPRING SUMMER COLLECTION, HE DID THE MAKE UP HIMSELF AND SHOT THE VISUAL - APPROPRIATELY CALLED rebirth. He knew his time was up, he never made it to our training in May 2007. He never made it to Paris when we re-launched the flagship store in St. Germain is September 2007. He never made it to Bangkok last December to meet with the whole shu uemura family. He knew he had to leave us with something more than just a makeup collection - he left with us his legacy - a subliminal message, which only the most genuine shu uemura follower will decode: REBIRTH - he forever lives on. He lives on in me forever. My fate was sealed today. How can I ever repay a man who changed my life? A brand that molded me and made me. A brand that I live, breathe, eat and sleep. A brand I made huge sacrifices for. A brand that meant ending many relationships with those I loved. I now know that I will grow old with this brand. Xeng, Tessa, Tina and our shu team - we are the last of the Mohicans. It is our duty to keep that passion alive, because it is not about us or the glory or the recognition - it is about him. Thank you to all the avid supporters, many of you have gotten into trouble because it seemed like you were playing favorites and always featuring us in your pages. Without you, Shu Uemura would not be the #1 brand in the country today. Not bad for a couple of girls who only had passion and ambition to start with huh? Wow. sad. That was a good tribute Xeng wrote. to the 3rdworld stylist: what, pray tell, are you talking about?